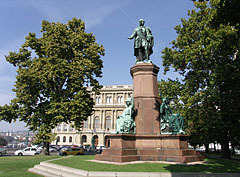 Fountain in the middle of the square, it is called "Fountain of the water pouring children"
The statue of the politician and statesman Ferenc Deák (1803-1876) with the four side character is an artwork of three sculptors: Adolf Huszár, Ede Mayer and Adolf Kessler. The bronze sculpture group was created in 1887. 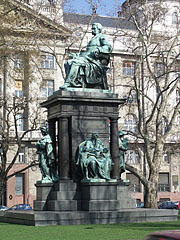 The about 16-meter-tall bronze and granite memorial monument with the four side figures was created by the Hungarian sculptor József Engel in 1880. 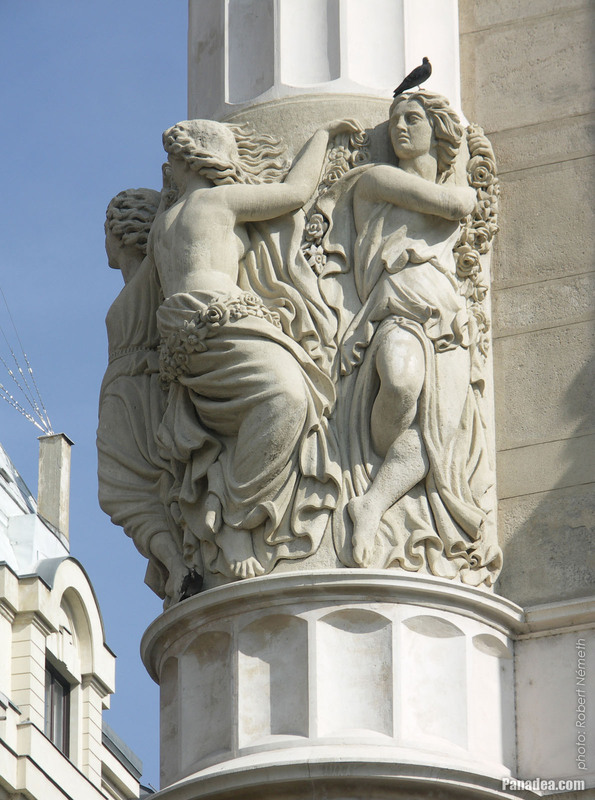 The allegorical female figures on the facade of the second floor were created in 1865 by Emil Wolff, a German sculptor from Berlin, Germany. 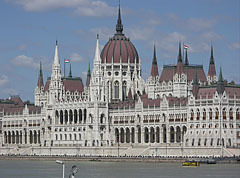 It was created in 1887, based on the plans of Adolf Huszár. 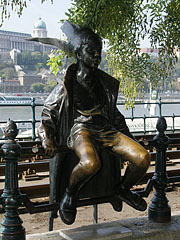 The bronze statue called "Little Princess" ("Kiskirálylány") of the Munkácsy and Kossuth Awarded sculptor László Marton is sitting on the cast-iron railing on the Danube bank promenade ("Duna-korzó") in Budapest. The initial 50-centimeter-tall statuette was created by the artist in 1972, the inspiration came from his 5-6 years old daughter, when she played the role of a little princess or queen (just to mention, this role-playing game is the so-called "make believe"). The life-size bronze version of the statue was placed on the Danube bank at the Vigadó Square in 1990. 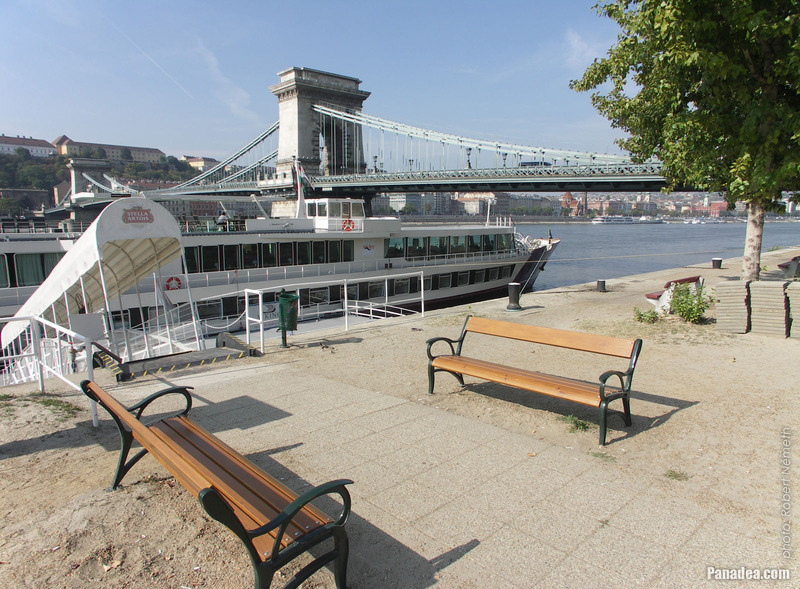 Interestingly the "Little Princess" statue has two more copies in the world. 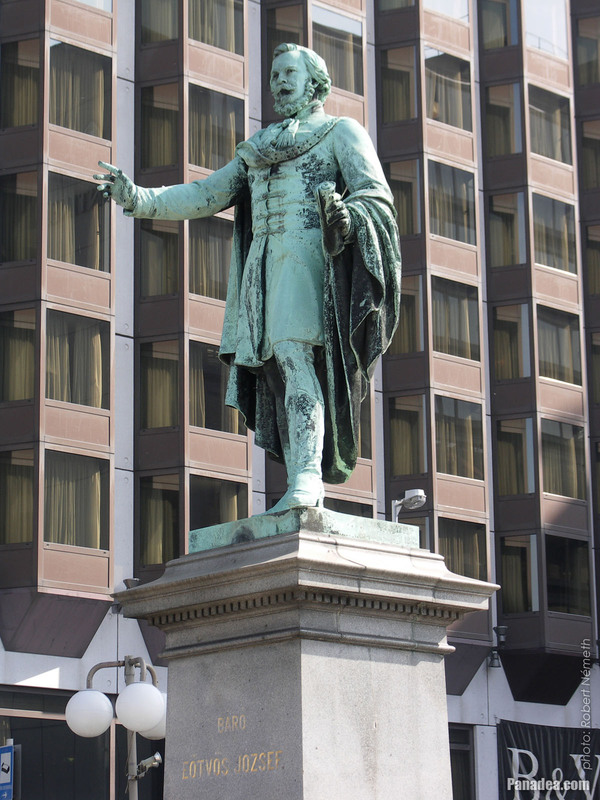 One is in the Balaton Uplands in Tapolca town (the birthplace of László Marton) in the park near the Malom Lake, as well as the other statue is located far away, in the capital of Japan in front of a concert hall of Tokyo (at the Tokyo Metropolitan Art Space cultutal center). 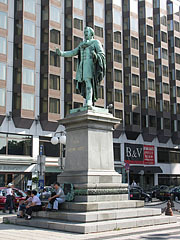 This latter statue was set by the donation of the sculptor. 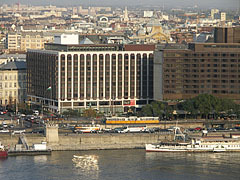 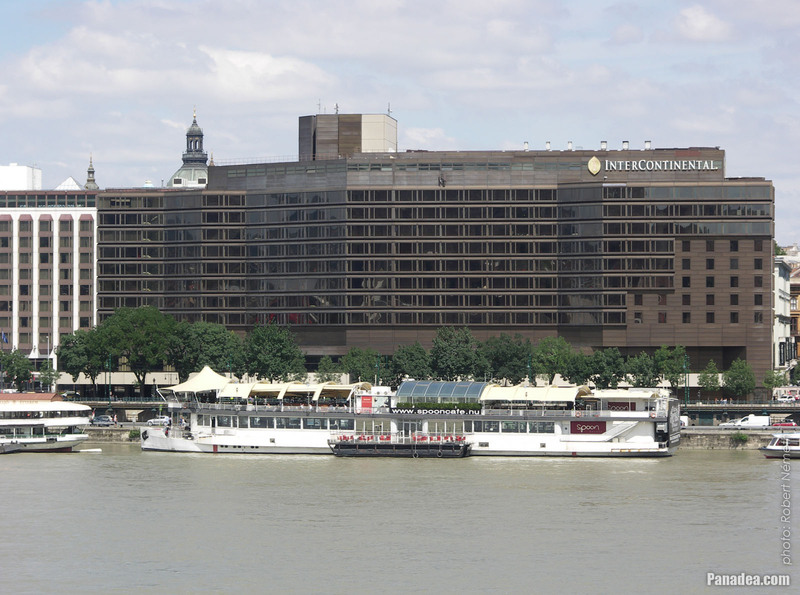 The former Hotel Atrium Hyatt Budapest (today Hotel Sofitel Budapest Chain Bridge) was built in 1983, designed by Lajos Zalaváry architect and István Németh interior designer. 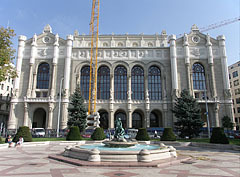 It was built on the site of the former neoclassical style Lloyd Palace, which was damaged in the World War II and later it was demolished. 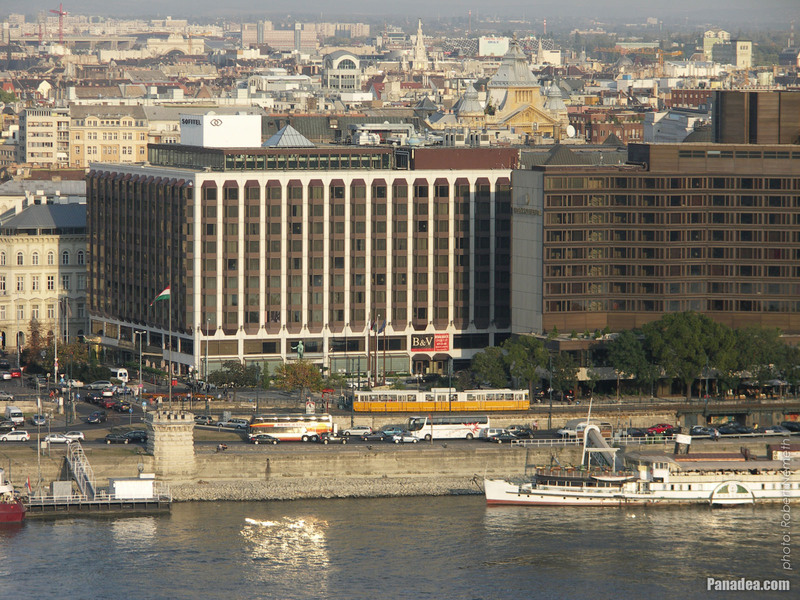 In the lobby (atrium) of the hotel also a vintage Hungarian airplane can be seen. 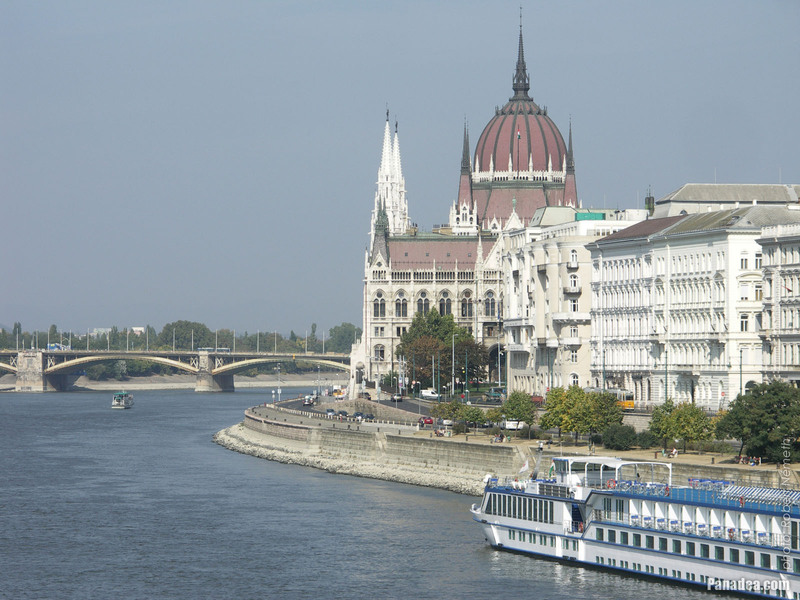 When in 1909 the world-famous French Louis Blériot (who first flew over the English Channel) visited to Hungary, many Hungarian professionals got inspiration to build an airplane. 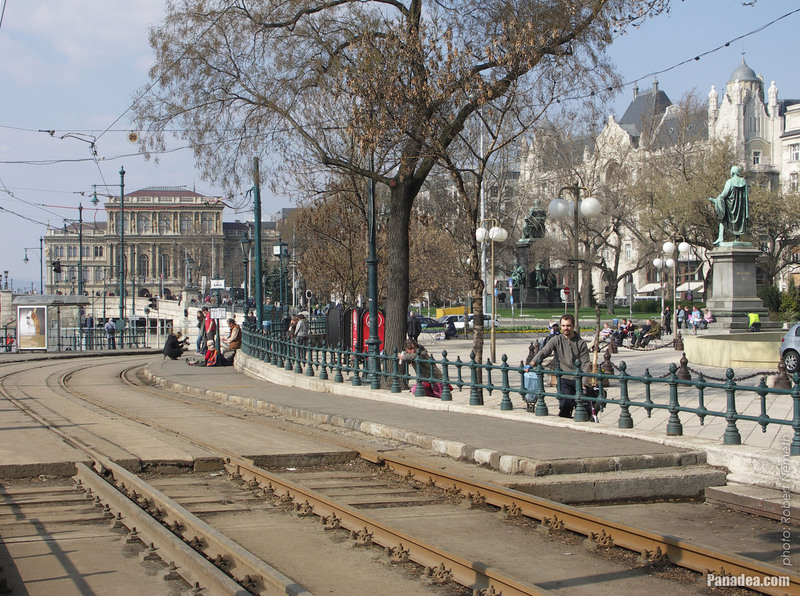 One of the results of the experiment was at the end of 1911 the "Horváth III" monoplane aircraft of Ernő Horváth mathematician, teacher and pilot, which was built by the specialist just for fun. After some test flights with the model in Budapest Rákosmező (or the Mátyásföld airport, belongs to the 16th district) and in the countryside the more serious challenge could began. 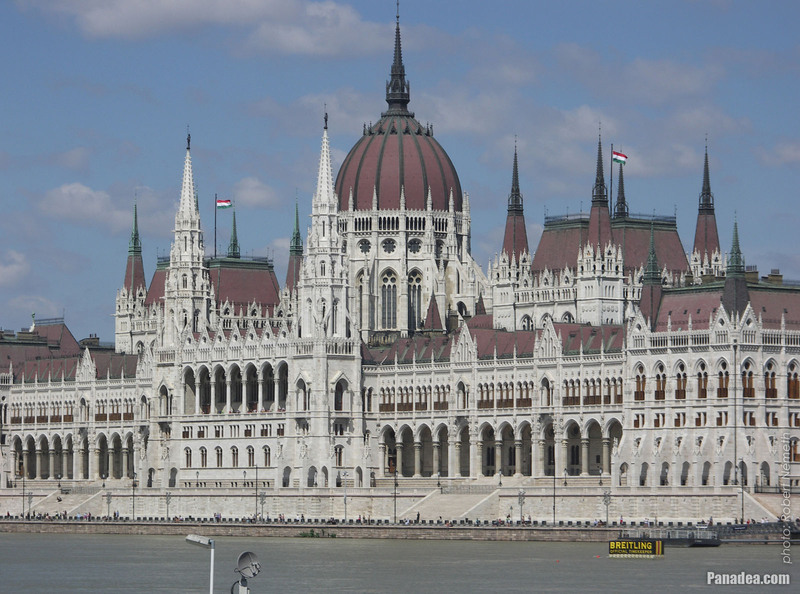 Due to his earlier flight accident, Ernő Horváth now entrusted this task to a qualified pilot, to the Italian-born Hungarian aircraft designer and pharmacist Guido Prodam. 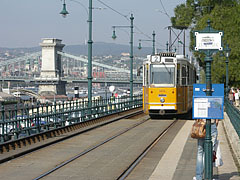 With the "Horváth III" the pilot successfully flew over the Kvarner Bay in Fiume town (today Quarnero Bay in Rijeka, Croatia). 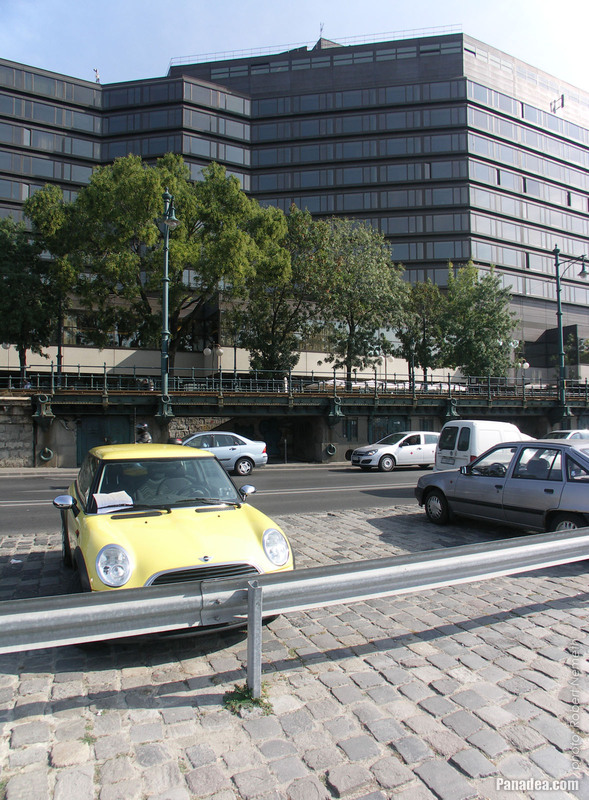 In memory of Guido Prodam there are memorial plaques in Mátyásföld (16th district), as well as a public domain called "Prodám utca" (Prodam Street). 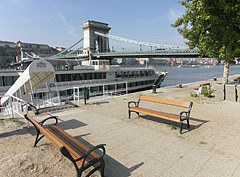 So the airplane became famous, then it was placed into the Royal Hungarian Transport Museum ("Királyi Közlekedési Múzeum"). 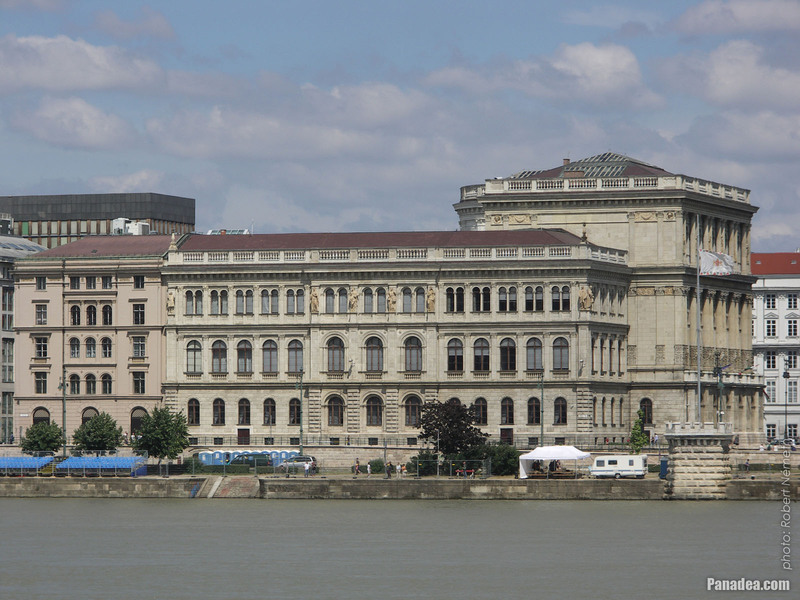 This museum was hit by a bomb in the World War II and the original "Horváth 3." 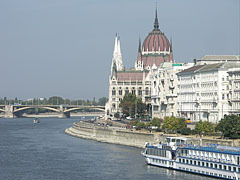 (more precisely the "Horváth III/A") aircraft was destroyed as well. 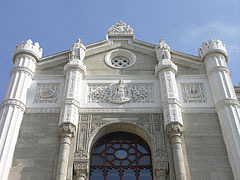 Later it was reconstructed by the original plans and two copies were built. 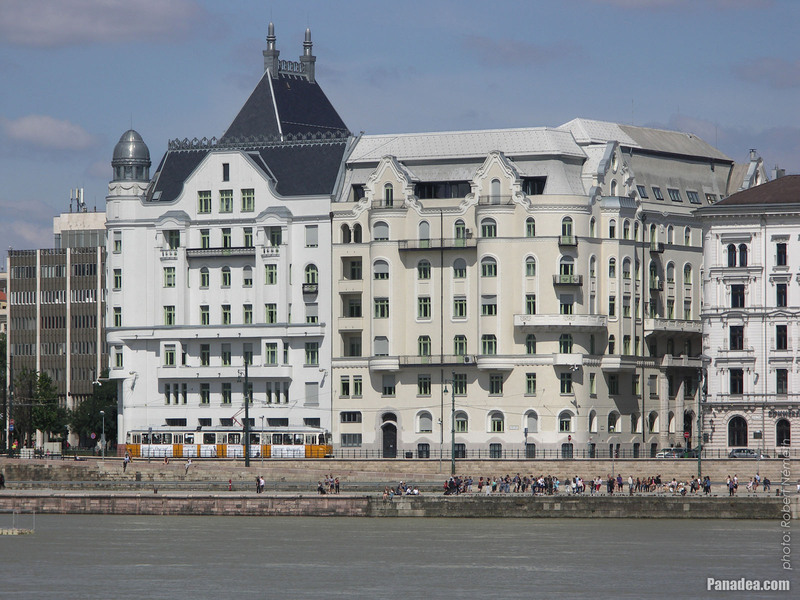 One of them can be seen today in the five-star hotel on Eötvös Square, suspended from the ceiling in the lobby, and the other one is in a private aviation museum in Hannover, Germany. 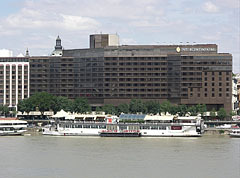 The exhibited pioneer Hungarian aircraft in the atrium could also refer to something else: between 1981 and 2001 the former Atrium Hyatt Budapest (today Sofitel Budapest Chain Bridge) luxury hotel was partially owned by the MALÉV Hungarian Airlines company. 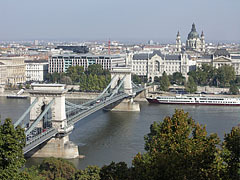 The MALÉV airlines was stopped flying and was shutdown in 2012. 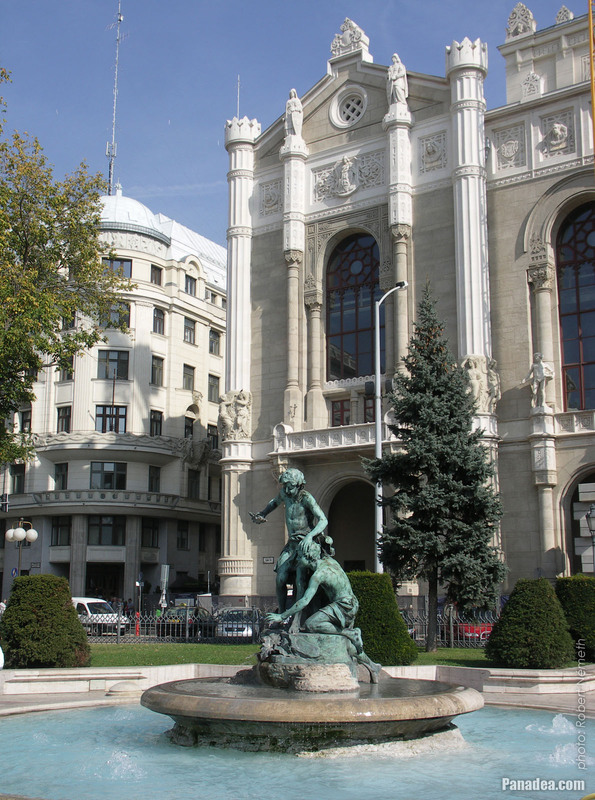 The first "Vigadó" of Pest (literally means about "Place for Merriment") was designed by Mihály Pollack, the neoclassical style building was also called "Redoute" or "Redout", it was a theatre and dance hall, opened for the public in 1833. 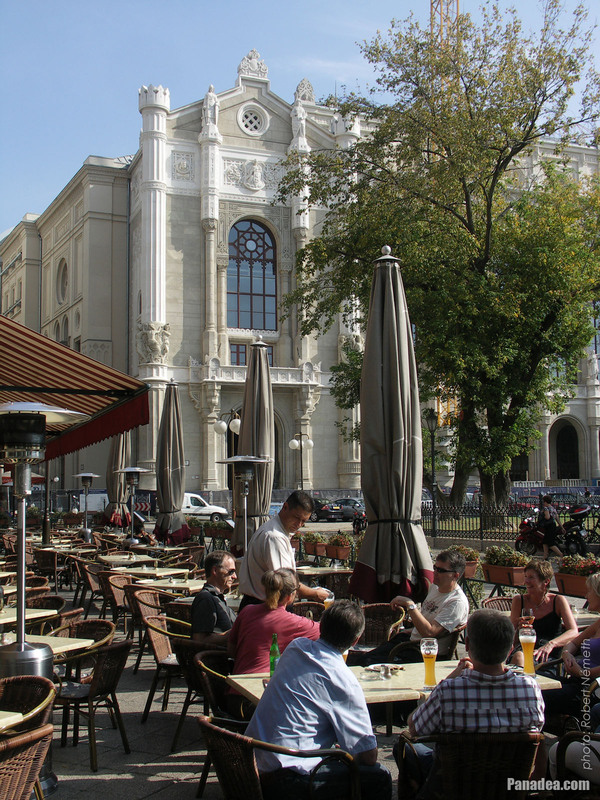 Its importance of that time can be seen by the fact, that even the famous Ferenc Liszt gave a concert within its walls, as well as the Austrian composer Johann Strauss I (1804-1849, often called the "Orpheus of Vienna", among others author of the " Radetzky March") was also here. 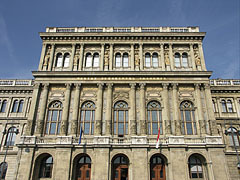 During the Revolution and War of Independence of 1848-1849 the meeting of the first Hungarian House of Representatives ("Képviselő Ház") was here. 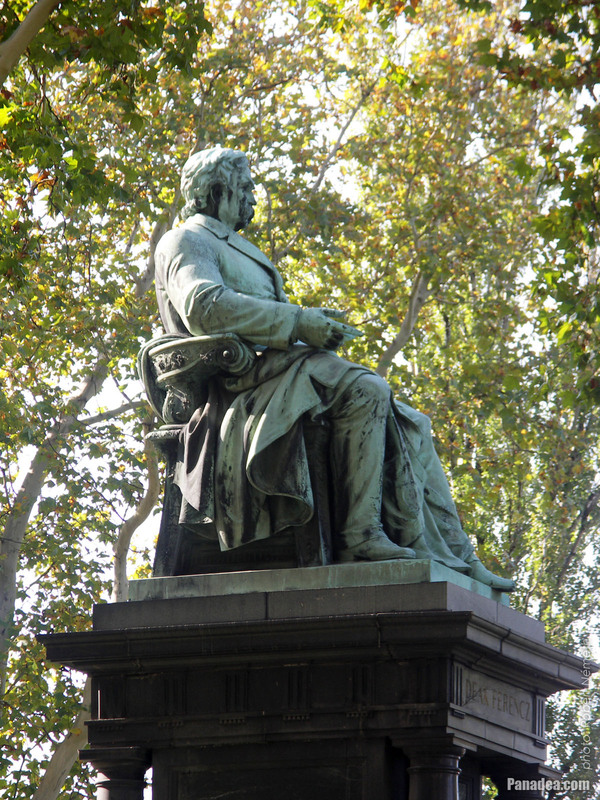 Probably thanks to this, as well as due to its cultural importance in 1849 the Austrian major-general Heinrich Hentzi totally destroyed it by a heavy gun-fire. The cannons of general Hentzi (deployed in Buda) caused enormous destruction, because there were no military targets they shot the civil buildings, probably just to terrify and terrorize the Hungarian people. 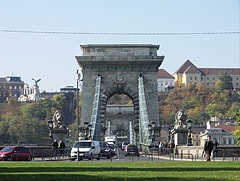 A lot of monuments and buildings became the victim of the pointless destruction, including for example the Chain Bridge ("Lánchíd"). 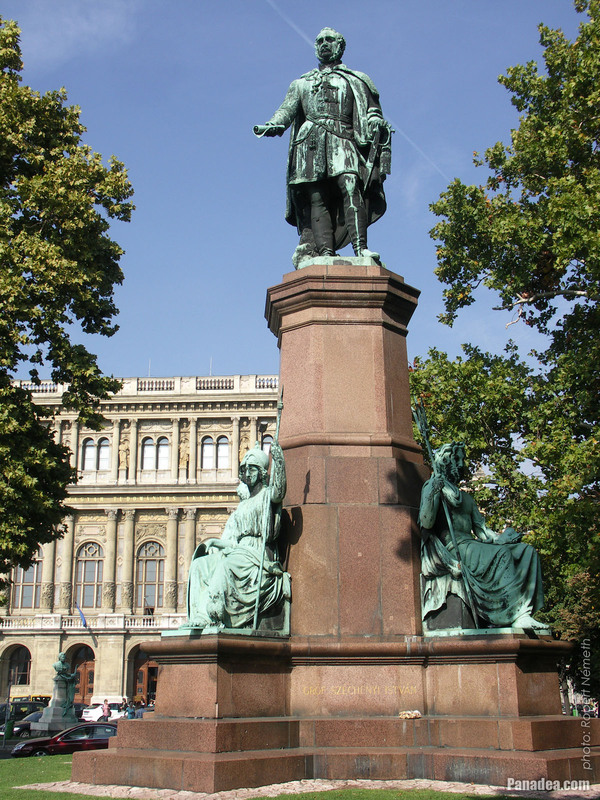 Nevertheless the Austrian major-general met his destiny just few days after destroying the first "Vigadó" building: in the Szent György Square in the Buda Castle he finally received a mortal wound. 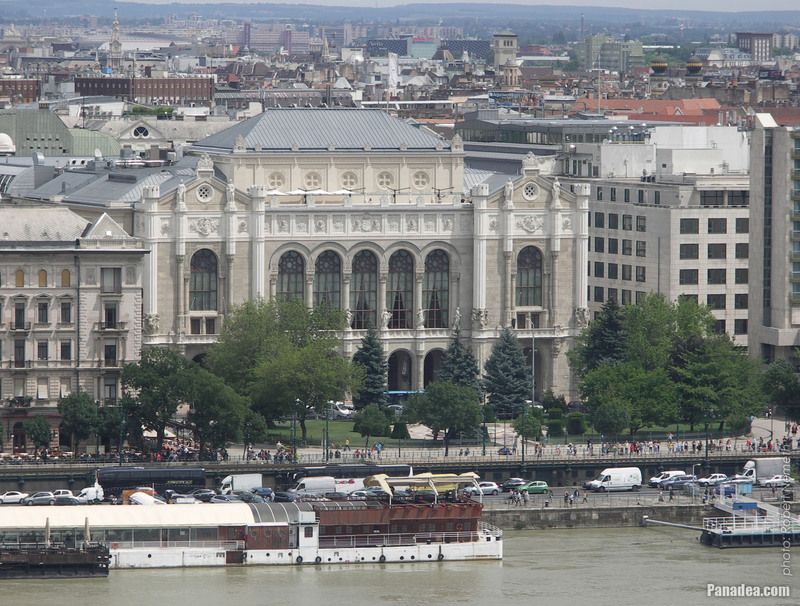 The "Pesti Vigadó" concert hall was seriously damaged in the Second World War, like inconceivably many other buildings in Budapest. 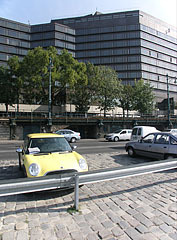 After many debates if it's worth or not to restore it the reconstruction finally began in the 1970s, and finished in 1980. 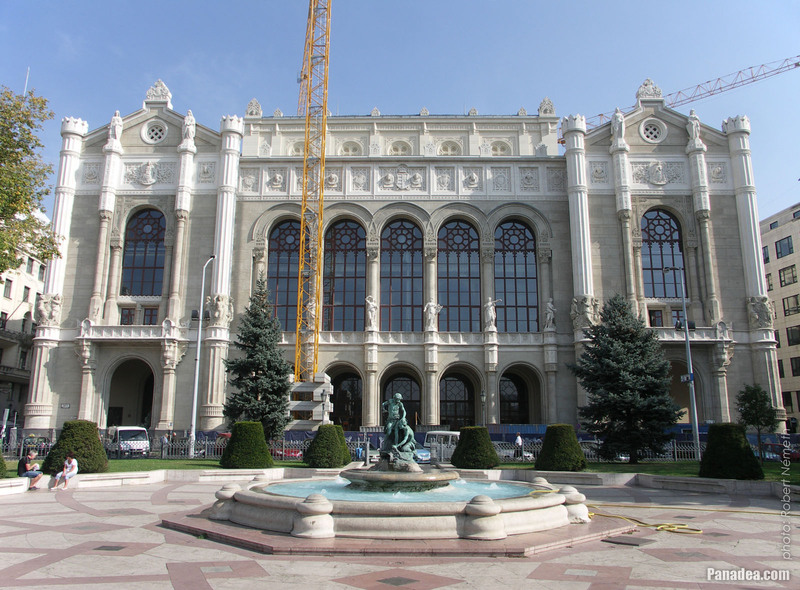 Between 2011-2014 there were more renovations on the building as well. 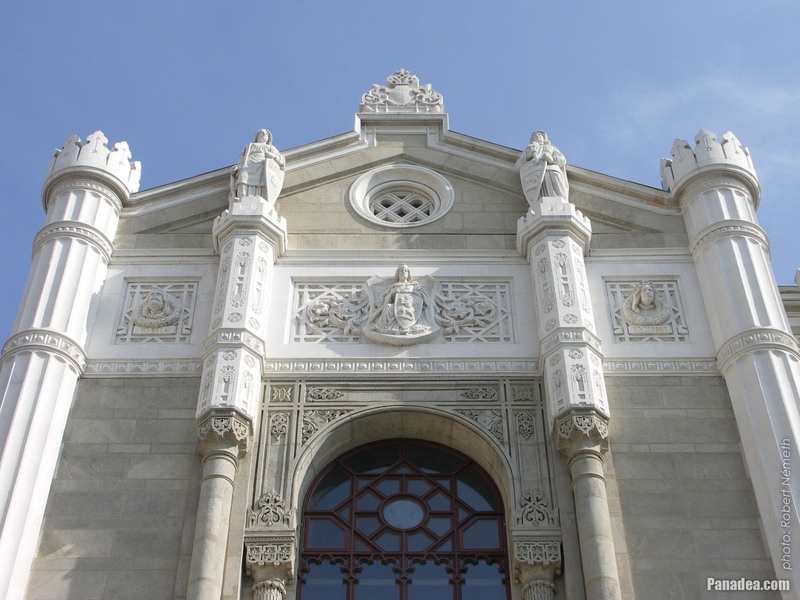 Not much is well known, but there is another building with the name "Vigadó" and also for cultural purposes. 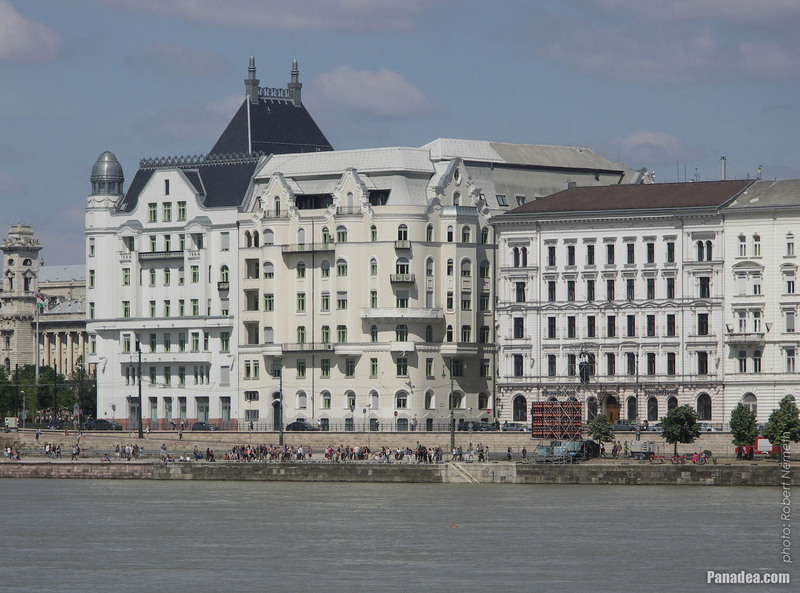 This is the so-called "Budai Vigadó", it is loacated on the other side of the Danube River on the Corvin Square in Buda quarter, it was built in 1899, designed by Mór Kallina and Aladár Árkay. 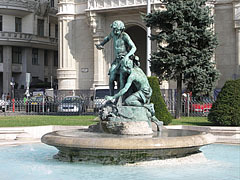 The so-called "Fountain of the water pouring children" (in Hungarian "Vízcsorgató gyermekek kútja" or "Ürgeöntő gyermekek kútja") was created by Károly Sennyei in 1896, it was set here in the Vigadó Square on the Danube bank in Budapest. The bronze statue group is encircled by a limestone pool with a stone bench around its edge. 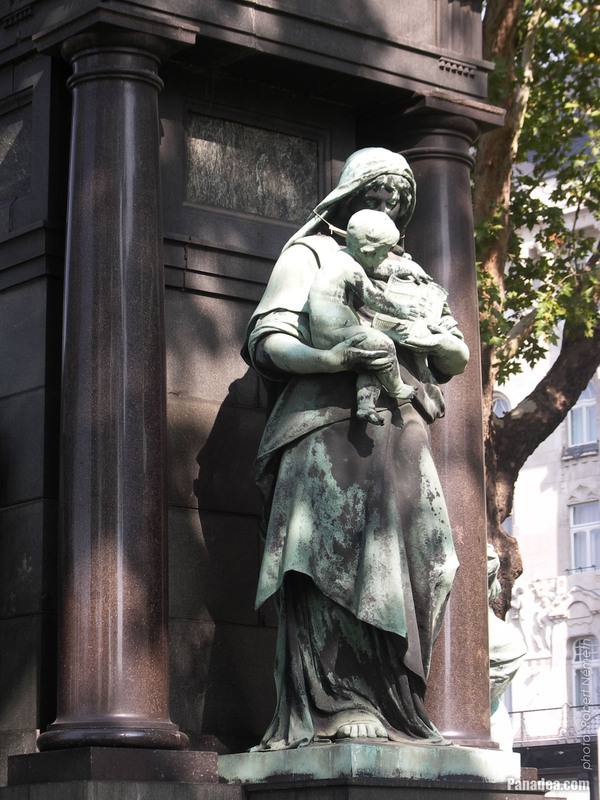 As most of the statues and monuments in Budapest, this has its own history, too. 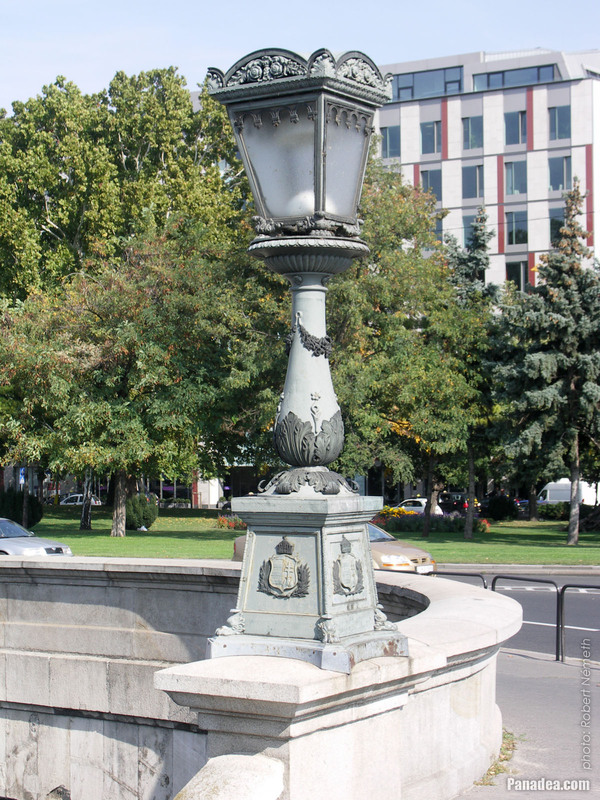 After the World War II the soviets erected a war memorial for themselves on the site of the fountain, but fortunately the statues and sculptures of the fountain weren't destroyed: these were placed in the the area of the Dagály Thermal Bath. 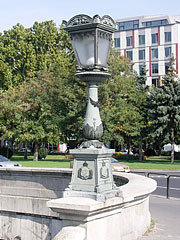 So the fountain stood there until 2000 when finally it was placed back to its original site. 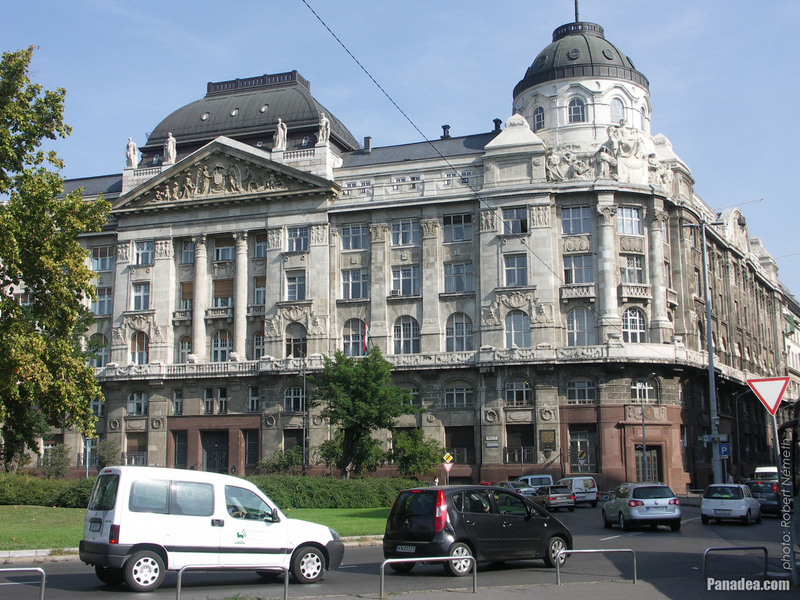 The current "Pesti Vigadó" building was designed by Frigyes Feszl in 1858 and was completely built in January 1865, and the beautiful building immediately caused a stir. 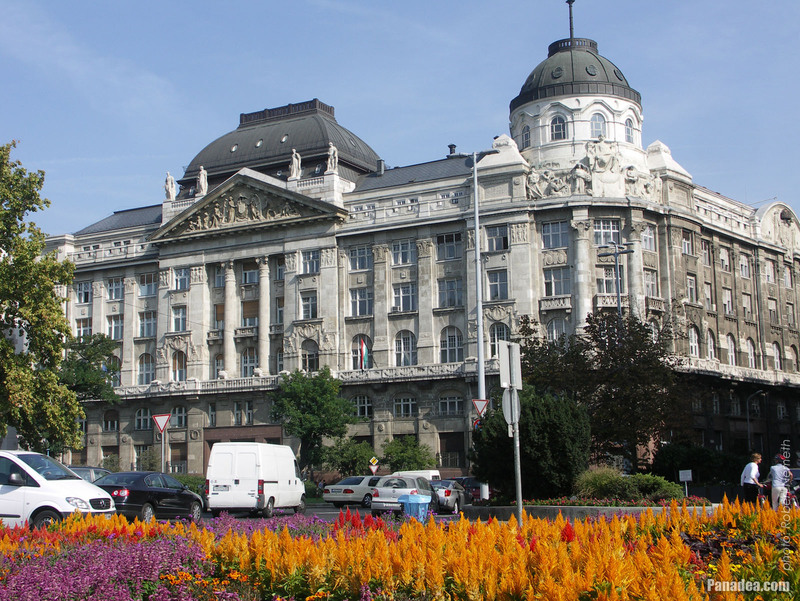 The building is romantic style mixed with oriental elements, the interior is decorated with the wall paintings of Mór Than and Károly Lotz and sculptures of Károly Alex. 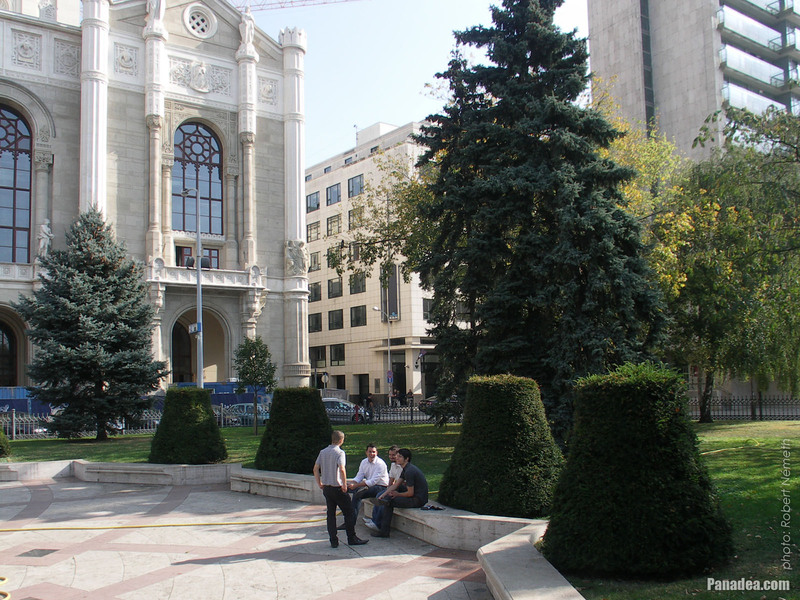 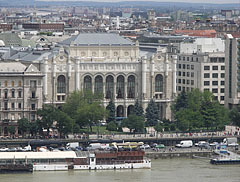 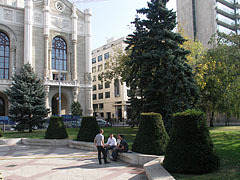 The "Pesti Vigadó" soon became one of the most important community and cultural centers of the future capital city, many world-famous composers and singers performed in its concert hall (for example Ferenc Liszt, Ferenc Erkel, Béla Bartók, Zoltán Kodály, Johannes Brahms, Camille Saint-Saëns and Claude Debussy composers, Bruno Walter and Herbert von Karajan conductors, or the Polish pianist Arthur Rubinstein). 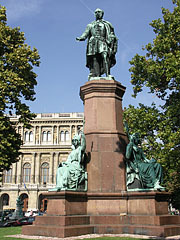 On the main facade of the "Pesti Vigadó" there are head statues of famous Hungarian kings, war-lords and politicians, created by János Marschalkó originally in 1865. 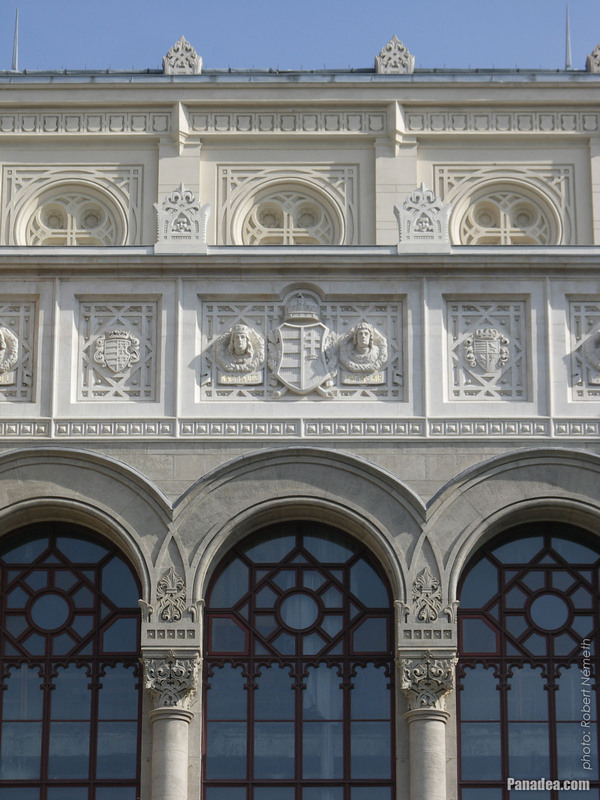 On the two sides of the coat of arms of Hungary it is King Louis I of Hungary (Nagy Lajos) on the left, and King Matthias Corvinus (Hunyadi Mátyás) on the right (the other statues: John Hunyadi and Miklós Zrínyi military leaders, as well as István Széchenyi and Archduke Joseph of Austria 19th-century politicians). 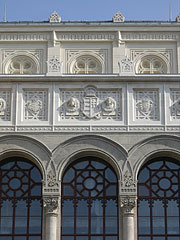 The statues and decorations on the front wall are "just" re-sculpted copies of the original ones. 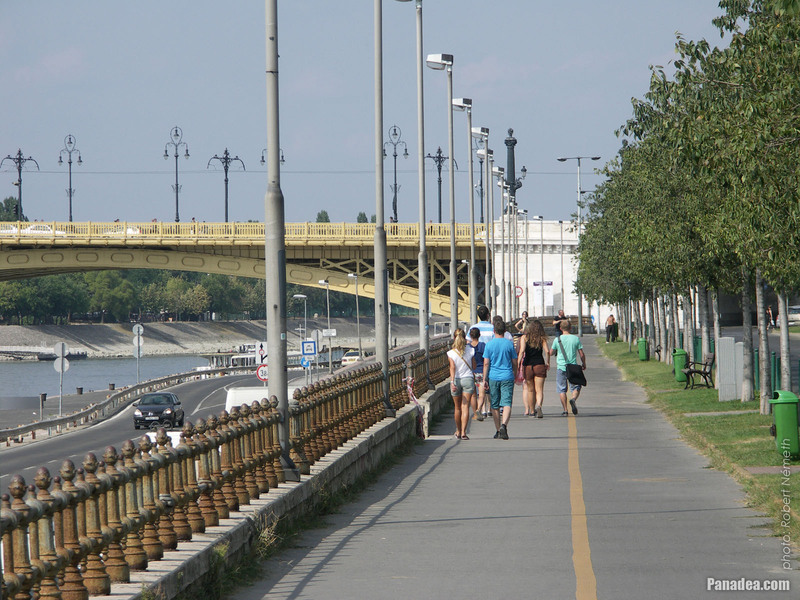 Unfortunately the "Pesti Vigadó" was also caught up in the actual political winds. 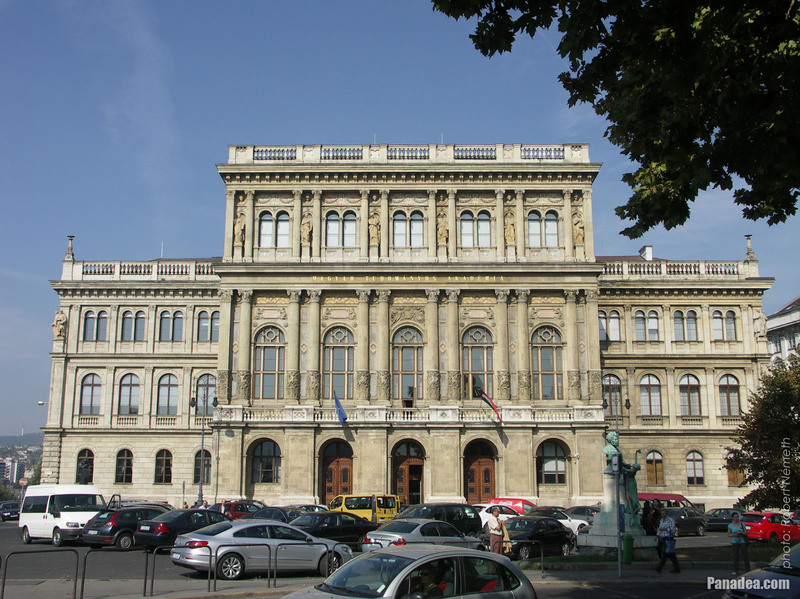 In 2013 the building (together with the "Műcsarnok" or "Hall of Art" and the Hild Villa in Buda) was passed by the right-wing government to the highly conservative Hungarian Academy of Arts (in Hungarian "Magyar Művészeti Akadémia" or MMA) by law and for completely free. 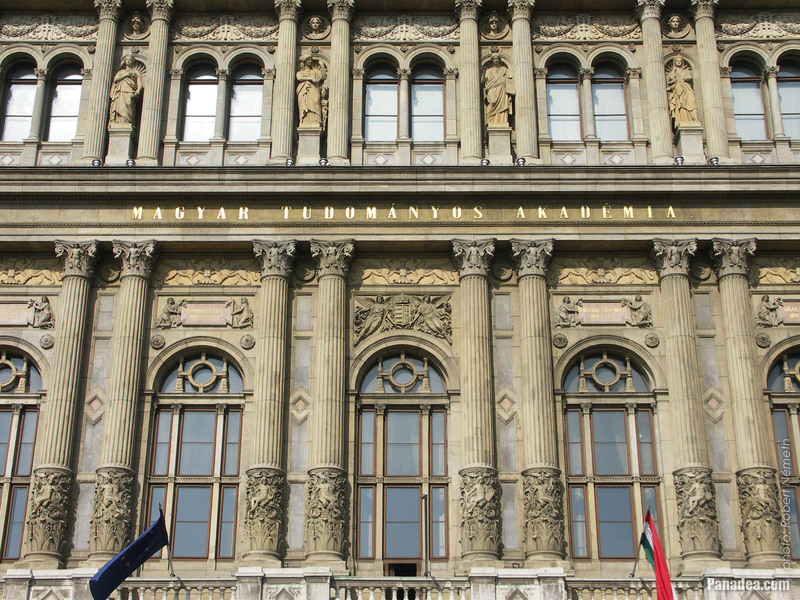 The MMA was established in 1992, initially it was just a forum for the artists, often called Makovecz Academy after the Hungarian architect Imre Makovecz (1935-2011), who was one of the founding members and also the honorary life president of the institution. 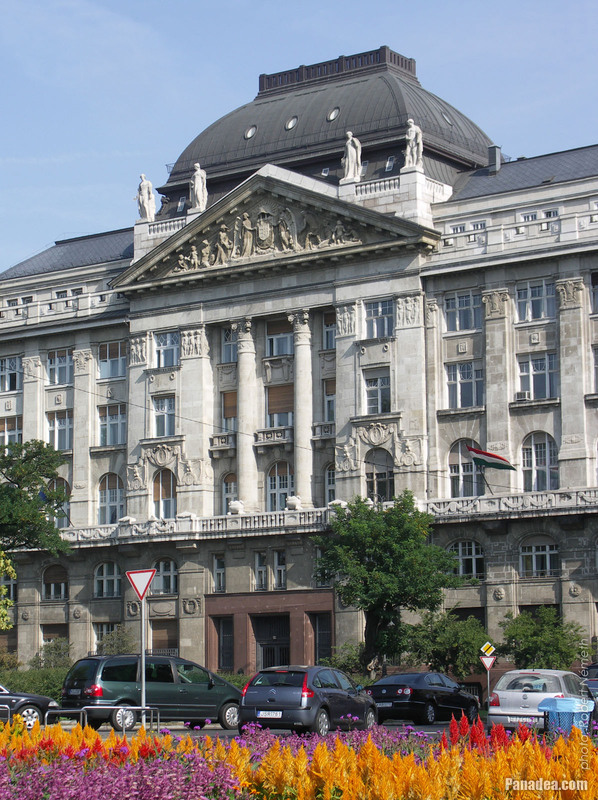 When the second Fidesz government came to power in 2010, first they turned this non-governmental organization (NGO) to a public body in 2011, then in 2012 they easily wrote it into the Constitution of Hungary next to the 188 years old Hungarian Academy of Sciences (MTA). By this the Széchenyi Academy of Literature and Arts (in Hungarian "Széchenyi Irodalmi és Művészeti Akadémia" or SZIMA) which was also established in 1992 for the same reasons but founded by the Hungarian Academy of Sciences (MTA) got a big hit below the belt. 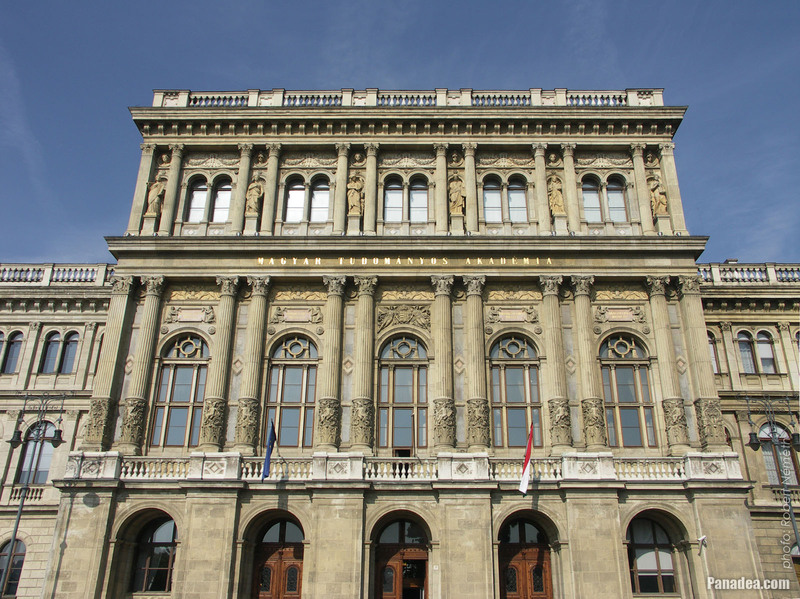 Because the founder members of the MMA coming from the same civil society organization, many people fear they will try to define and determine the orientation of the Hungarian art at political level and from public money. 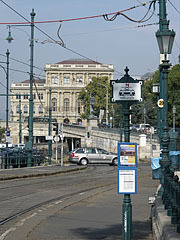 Unfortunately some signs are already apparent in this respect, for example in the case of the Hall of Art ("Műcsarnok"). 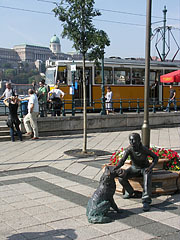 The "Girl with her dog" statue on the Danube bank promenade at the Vigadó Square is created by Dávid Raffay, inaugurated here in 2007. The life-size bronze girl who is sitting on a stone bench and playing with her dog is a typical genre sculpture (pictorial representation of a scenes from the everyday life), and beside the "Little Princess" statue it is another cheerful dash of color in the square. 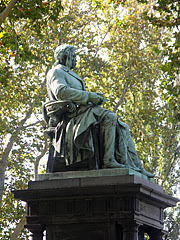 The 4-meter-tall full-length bronze statue of Baron József Eötvös (1813-1871) Hungarian writer, politician, minister and lawyer was created by Adolf Huszár sculptor in 1879, it is standing at the foot of the Chain Bridge in the Eötvös Square. 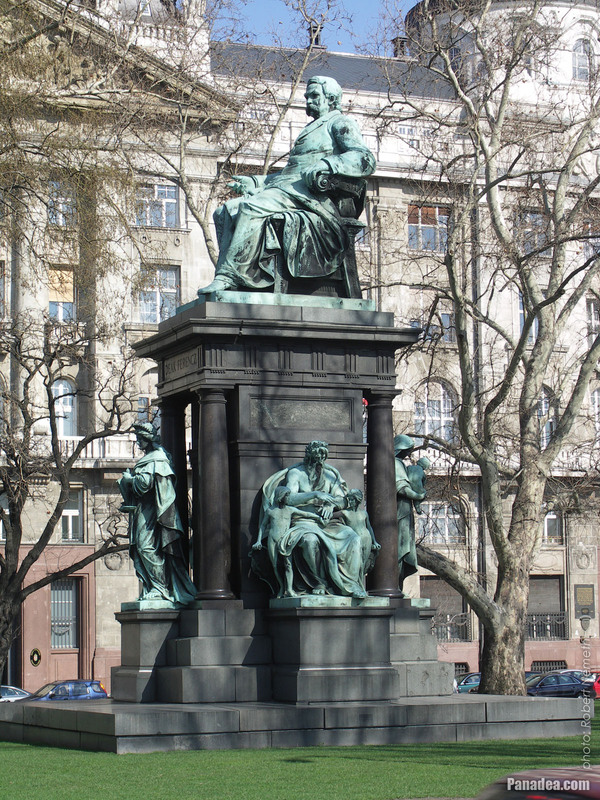 Among others Baron József Eötvös was the Minister of Religion and Education of the first Hungarian parliament, the Batthyány Government (and later also the Andrássy Government), as well as he was a memner of the Hungarian Academy of Sciences (MTA). 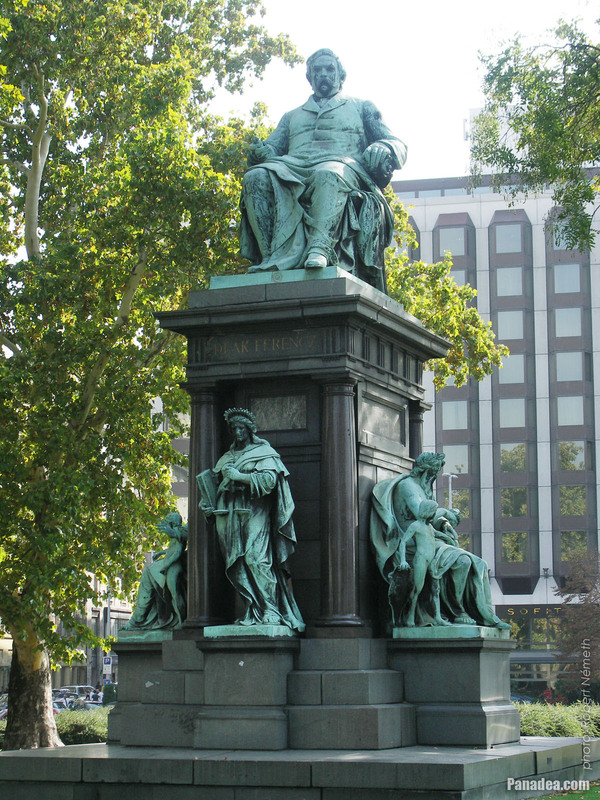 In addition he was the father of the famous Hungarian physicist Baron Lóránd Eötvös (also knows as Baron Roland von Eötvös, 1848-1919) who invented the so-called Eötvös pendulum or Torsion balance, a sensitive instrument to measure the small changes in the gravity, thus the density of the underlying rock layers. 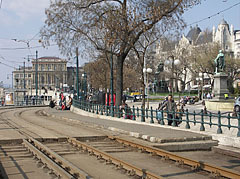 The present Széchenyi István Square in Lipótváros quarter was used in the past primarily for loading and unloading the boats, so it wasn't just accidentally called then "Kirakodó tér" and "Rakpiac tér" (literally "Unloader Square" and "Loading Market Square" or "Cargo Market Square"). 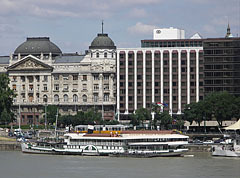 At that time on the site of the current monumental palace of the Ministry of Interior ("Belügyminisztérium") the Imperial and Royal Salt Bureau (or Salt Office, in Hungarian "Sóhivatal") building stood for a while, then the so-called Diana Bath or Diana's Bath ("Diana fürdő") was built in its place in 1823. 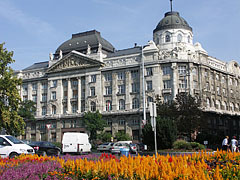 In the first third of the 19th century the square was dominated by the buildings of architect József Hild, and in this relation the three-story Diana Bath and residental building wasn't an exception. 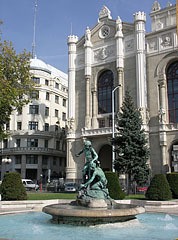 The name of the institution was initially Danube Bath (in Hungarian "Dunafürdő" or "Duna-fürdő"), it got its later name after the statue of goddess Diana that was stood in the colonnade inside the bath. 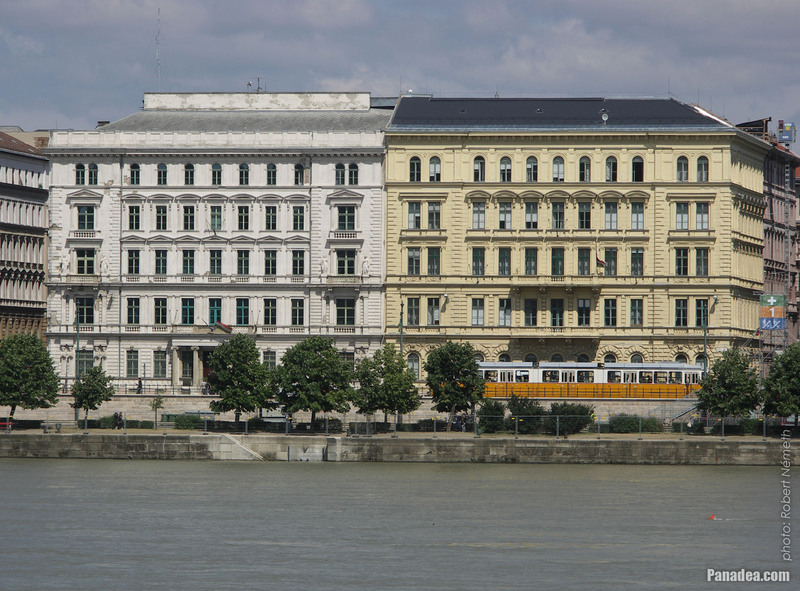 Upstairs in the building there were flats and a pension with apartments, until 1827 for some time here lived Count István Széchenyi, who the square is named after nowadays. 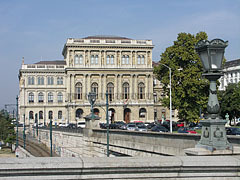 The Diana Bath was a public bath or bathhouse (more precisely a so-called tub bath with many bathrooms), so the people came here primarily for hygiene purposes, to wash themselves. 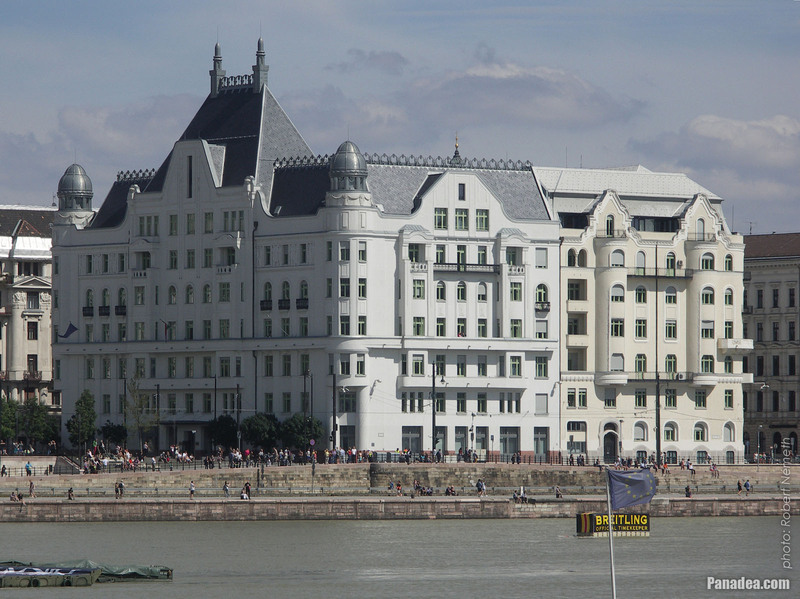 Thanks to among others its neatness, the good sanitary conditions and that it was well-equipped it soon became very popular, therefore in 1855 also a steambath was installed here. 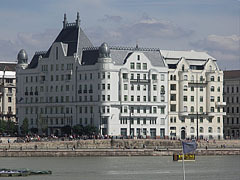 In 1879 it received already 2800 guests a year, its popularity started to decrease only after about 80 years of existence. 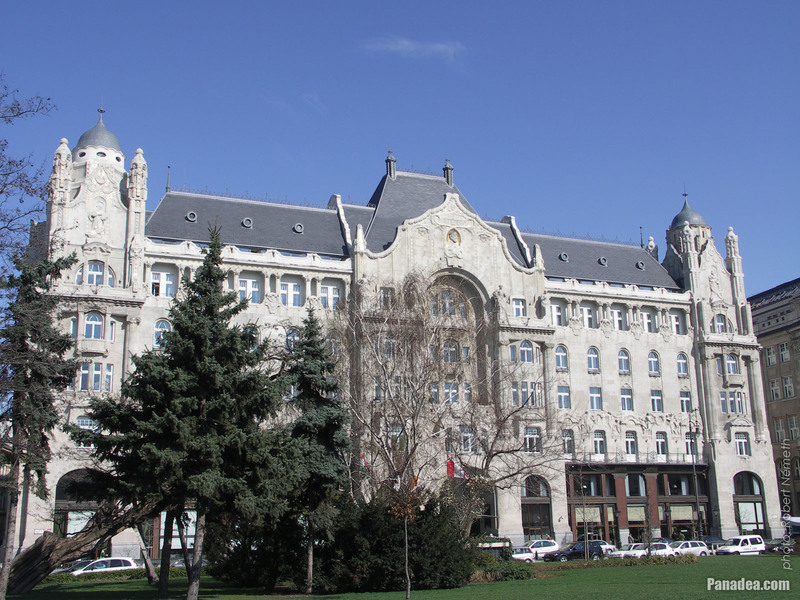 Then it was acquired by the Hungarian Bank of Commerce of Pest ("Pesti Magyar Kereskedelmi Bank") and in place of the old bath they built up the palace that can be seen today. 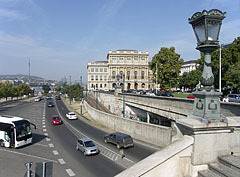 When in 1925 the Fürdő utca ("Bath Street") was renamed to József Attila utca (street) the memory of the once so popular Diana Bath slowly faded into oblivion in the public mind. 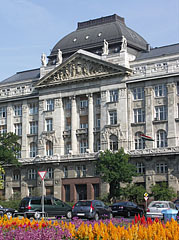 The central building of the Ministry of Interior ("Belügyminisztérium") was initially also an office building. 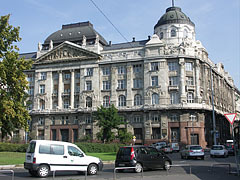 It was the headquarters of the oldest bank of Hungary in the modern sense of the term, the Hungarian Bank of Commerce of Pest (in Hungarian "Pesti Magyar Kereskedelmi Bank", founded in 1841), from the construction until its deprivatization after the World War II. 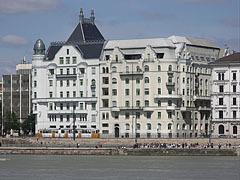 The eclectic style palace was designed by Zsigmond Quittner and built in 1905. 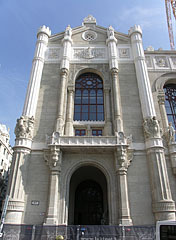 Among others prestigious Jewish merchants from Budapest and also Count István Széchenyi were contributed to the establishment of the Hungarian Bank of Commerce of Pest. 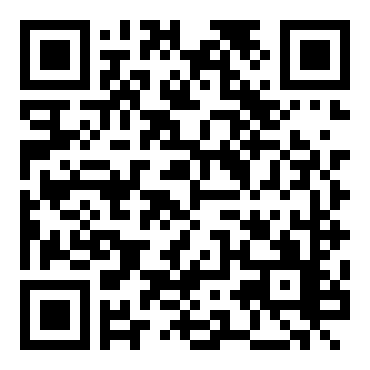 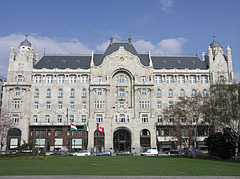 During its whole existence it was the leading commercial bank in Hungary. 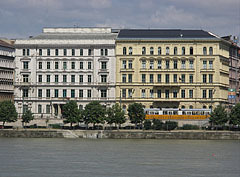 The first head office was on the former Gizella Square (today Vörösmarty Square) in the building that is known today as the Gerbaud House. 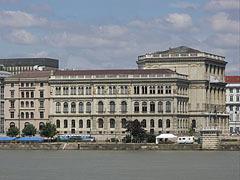 Around the end of the Second World War the fascist Hungarian Szálasi Government tried to transport the whole gold treasure of the bank (30 tons of gold) to the west on the so-called "second gold train", together with its foreign-exchange (forex) reserves and other assets, before the soviets do the same. 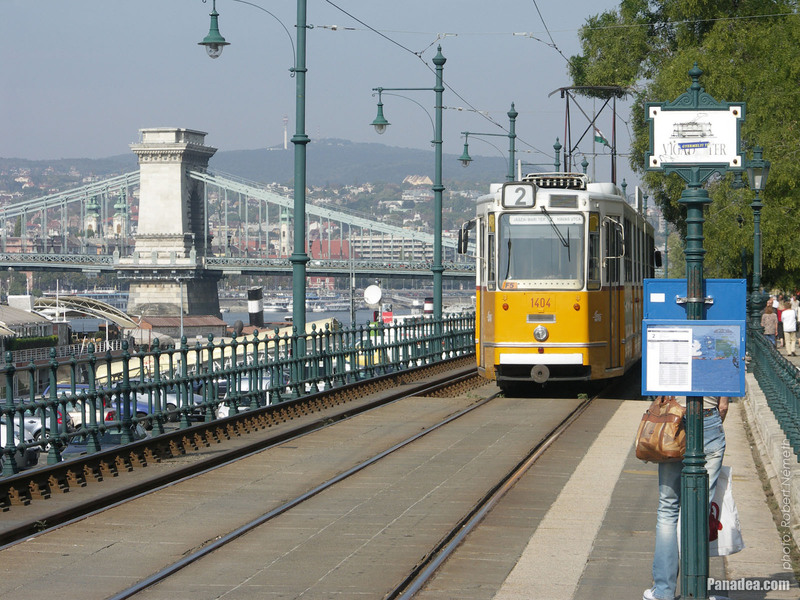 But the train was catched by the American army, the treasure was treated by them as war booty. 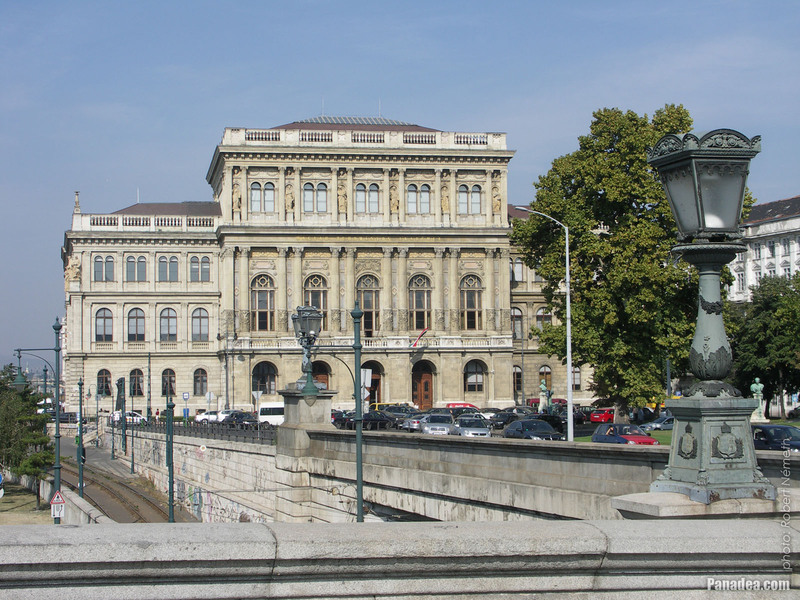 Finally in 1946 the US government gave back most of the seized treasure, but they retained a part of it. 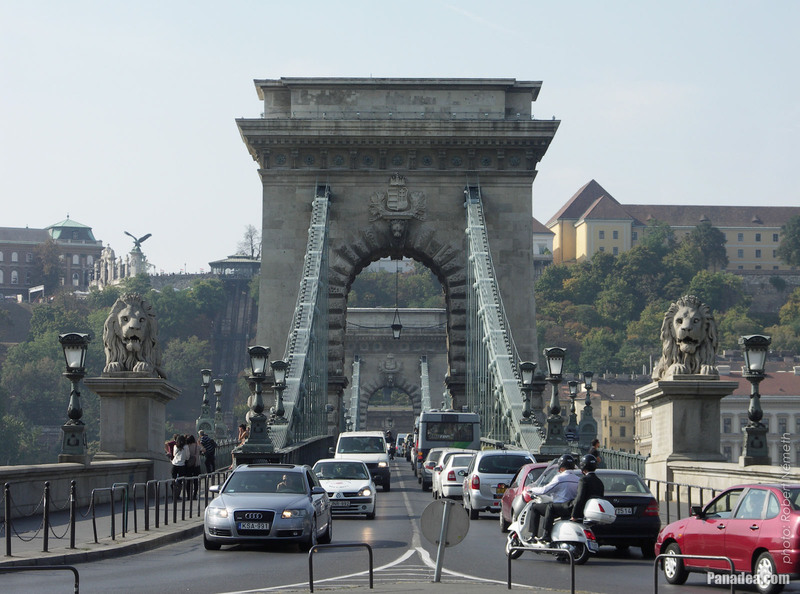 Due to this later some American immigrant Holocaust survivors initiated a lawsuit. 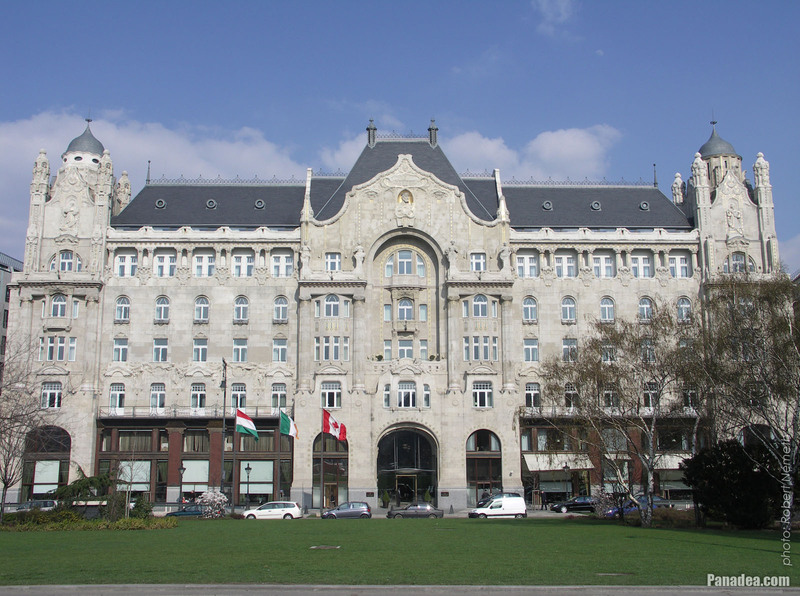 After the deprivatization in 1950 the bank was renamed to Hungarian Foreign Trade Bank (in Hungarian "Magyar Külkereskedelmi Bank" or MKB). 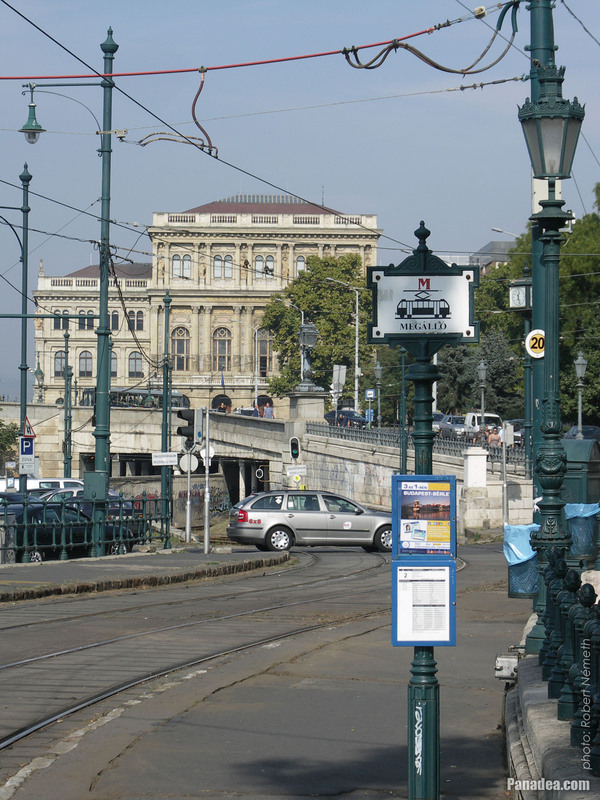 In 1994 the MKB bank was privatized again and it became the subsidiary in Hungary of a German/Bavarian bank. 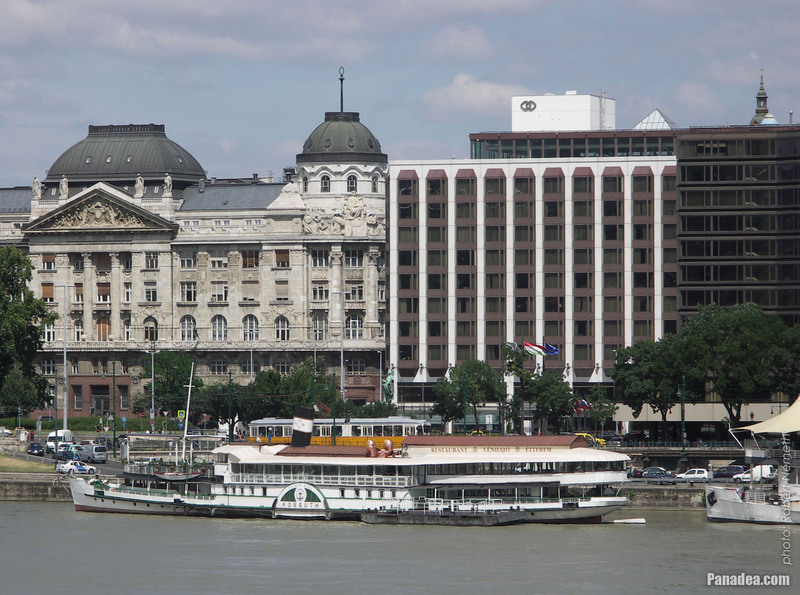 Then in 2014 the loss-making bank was bought from them by the Hungarian government (thus practically it was deprivatized again). 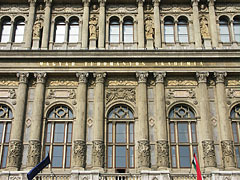 The Hungarian Academy of Sciences (in Hungarian "Magyar Tudományos Akadémia" or MTA) is a prestigious public body (statutory corporation), whose main tasks are: supporting the scientific research, the dissemination of scientific knowledge, as well as the representation of the Hungarian science abroad. 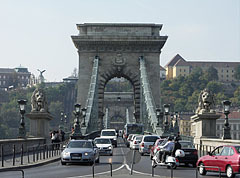 The Budapest headquarters of the organization is situated at the Pest-side end of the Chain Bridge on the Széchenyi Square (former Roosevelt Square). It was built between 1862-1865 in neo-renaissance style, designed by the German architect Friedrich August Stüler from Berlin, the construction was led and supervised by Miklós Ybl and Antal Szkalnitzky. 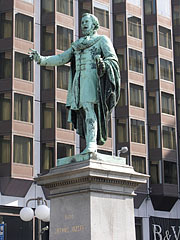 In front of the MTA headquarters building there is a bronze bust statue of Gábor Szarvas linguist, teacher and creator of the Hungarian linguistic purism (aka linguistic protectionism). 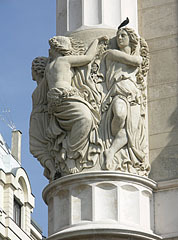 The statue with the two female figures was created by Gyula Jankovits in 1899. 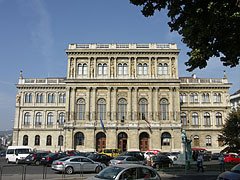 The main building of the Hungarian Academy of Sciences (MTA) is quite similar to the Stockholm National Museum (Nationalmuseum) building in Sweden. 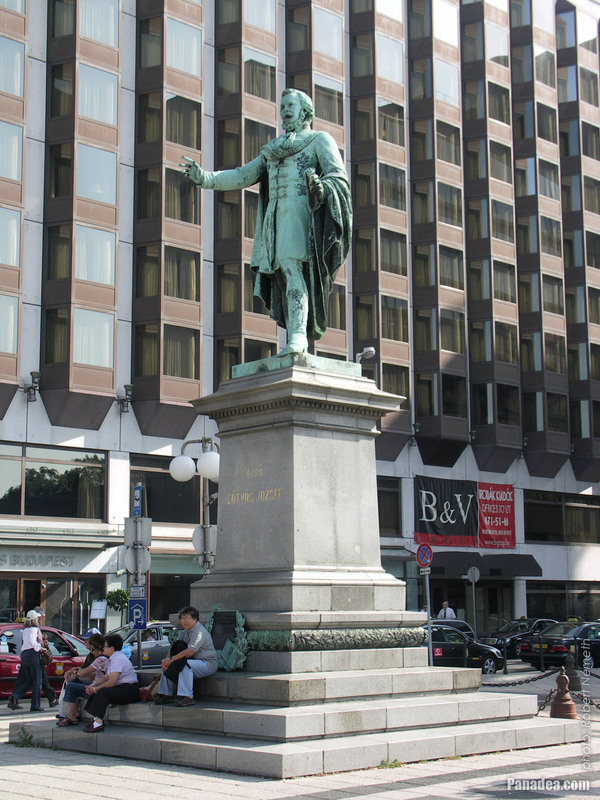 It is mainly due to the fact thet both buildings were designed by the same person: Friedrich August Stüler, the architect of the king of Prussia. 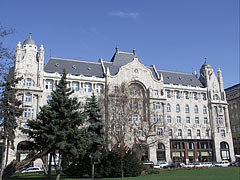 The Art Nouveau (secession) style Gresham Palace was initially the headquarters of the Gresham Insurance Company, it was built in 1907, designed by Zsigmond Quittner and the Vágó brothers. 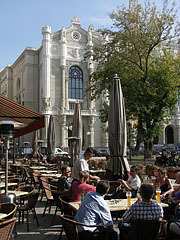 Formerly the now legandary Gresham Coffeehouse was operated on the ground floor of the palace, where among others the members of the "Gresham-kör" ("Gresham Club") art society held their get-togethers. 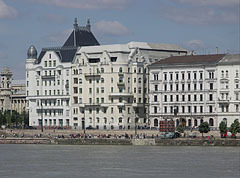 Nowadays the building is operating as a luxury hotel.